Aha! is an extensive and comprehensive roadmapping and project management platform that enables businesses effectively manage their product portfolio from conceptualization to implementation. With Aha! 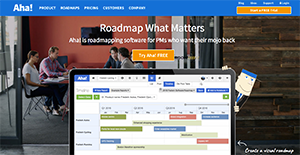 project management software, users can create viable business strategies and visual roadmaps for their companies. Aha! implements a framework that allows people and organization to interact, facilitate the flow of information, and collaborate towards achieving their business goals. Aha! is developed to help businesses, particularly project managers, set business visions based on goals. By analyzing the market and customers, users can then use the information to map out key strategic imperatives, build a viable business model, and determine how the pre-set goals can be achieved. Aha! is a perfect tool for team planning. By helping project managers build roadmaps and automatically inform team members for any changes or updates, release management becomes a brezze. Aha! also ecnourages employees, customers and other stakeholders to share concepts and potential innovations through its ideas portal. Through this feature, project managers engages the user community and gather their ideas, visualize their application, and then promote these concepts to the features. Every company is different, and can need a special Project Management Software solution that will be adjusted to their company size, type of clients and employees and even specific industry they deal with. You should not count on finding a perfect solution that will work for each company no matter what their history is. It may be a good idea to read a few Aha! reviews first and even then you should keep in mind what the solution is supposed to do for your company and your workers. Do you need an easy and intuitive solution with just elementary functions? Will you actually use the advanced tools required by pros and big enterprises? Are there any specific features that are especially practical for the industry you operate in? If you ask yourself these questions it is going to be much easier to find a solid app that will fit your budget. Aha! offers yearly and monthly subscription plans for businesses of different sizes and needs. A free version is offered to qualified startups. You can also try Aha! for 30 days absolutely free. We realize that when you make a decision to buy Project Management Software it’s important not only to see how experts evaluate it in their reviews, but also to find out if the real people and companies that buy it are actually satisfied with the product. That’s why we’ve created our behavior-based Customer Satisfaction Algorithm™ that gathers customer reviews, comments and Aha! reviews across a wide range of social media sites. The data is then presented in an easy to digest form showing how many people had positive and negative experience with Aha!. With that information at hand you should be equipped to make an informed buying decision that you won’t regret. Our roadmaps were finally carried over to the modern era! What are Aha! pricing details? What integrations are available for Aha!? Pros: The outstanding feature of this app is that we can easily track features and releases that are against our top-level corporate objectives. Moreover, it makes it easy to communicate our plans to both internal and external audiences keeping in mind our objectives and timelines. Its integration with Jira reduces manual work needed to keep things updated and communicate the plan. Cons: I don't like the fact that the per-seat cost is pretty high, so we have to reduce the number of people using Aha than we would like. The read-only role makes people to go to Jira instead. Pros: The best part about this app is that you can share the roadmap view with others. You can select the product features that you want to be included or excluded in this product. Moreover the auto-push feature to JIRA is very helpful. Cons: New users may find the app to be complex and the beginning and will need to use it frequently to easily navigate it. It's organization is confusing with its different sections and sub-sections. I wish that you could link a product feature to multiple initiatives. Currently you can only assign it to a single initiative. A tool with integration to a wide range of products. Support was quick and reliable. This thing barely made a scratch on the surface. If you need more information about Aha! or you simply have a question let us know what you need and we’ll forward your request directly to the vendor.